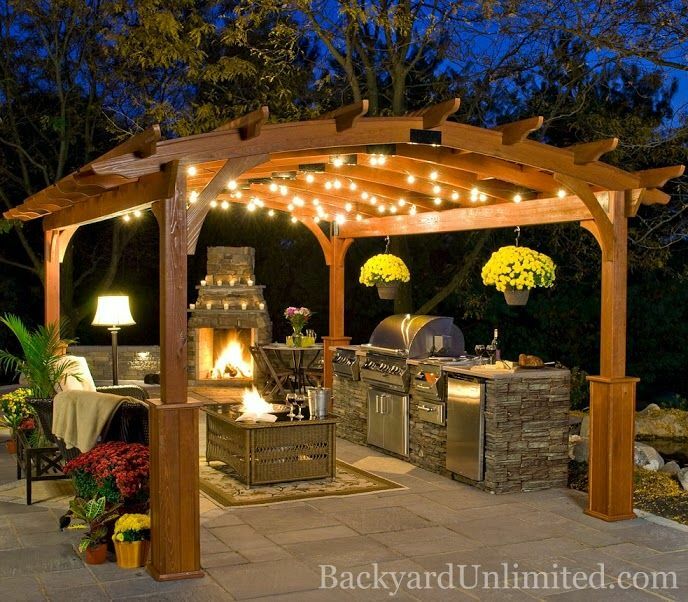 Rather than running in and out and running up your cooling bill, move the whole party outside with an outdoor kitchen. Whether it’s modest modern or full-service functional, create a space that makes backyard barbeques more beautiful than stressful. Minimalist and contemporary, this outdoor kitchen mixes metals, stones, and wood grains. Its backless design uses natural greenery as a backdrop and offers a light airiness to any backyard soiree. Created with simplicity and separation in mind, this little L-shaped outdoor kitchen packs a punch. Complete with a stove, storage, and dishwasher, this stone fortress makes the most out of modest real estate. Cookout kings would kill for this outdoor kitchen built to cater to a crowd. 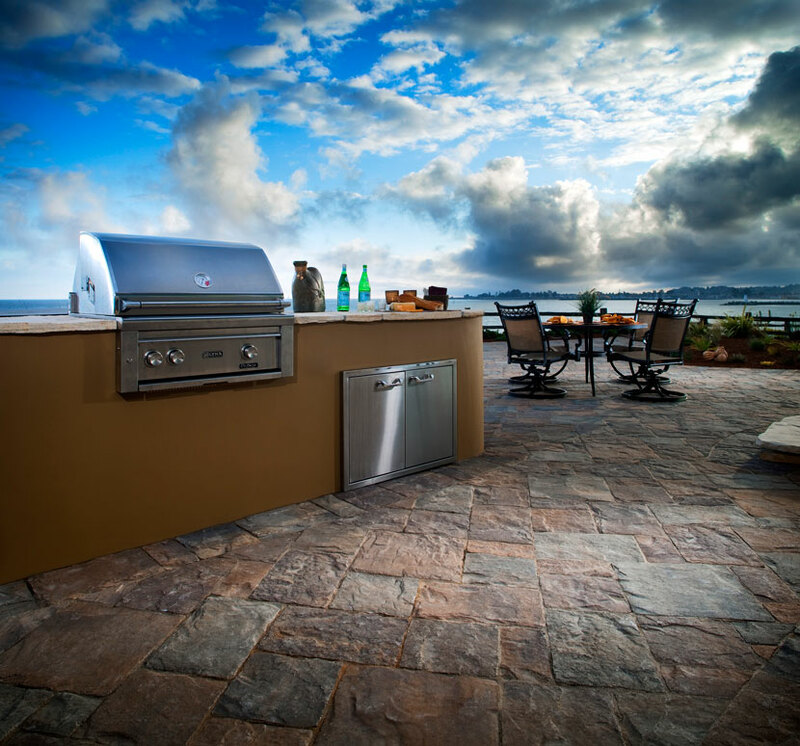 The hooded grate cooktop and gas grill does double duty for big parties with empty stomachs. The pergola shades the space during the midday sun and traps warmth on a windy night. Dark, dramatic paint give this cool cabana a contemporary feel while maintaining its coastal effortlessness. Stainless steel appliances and iron light fixtures are a striking contrast to the natural wood. This country-cool kitchen is a splendid addition to this second-story veranda, proving that outdoor kitchens don’t have to stay grounded. The balcony style construction provides privacy while still letting the breeze roll through. Rich earth tones juxtaposed by a white stucco make this fire-fueled outdoor kitchen inviting all year round. Stone floors trap heat, warming up the space both literally and figuratively. 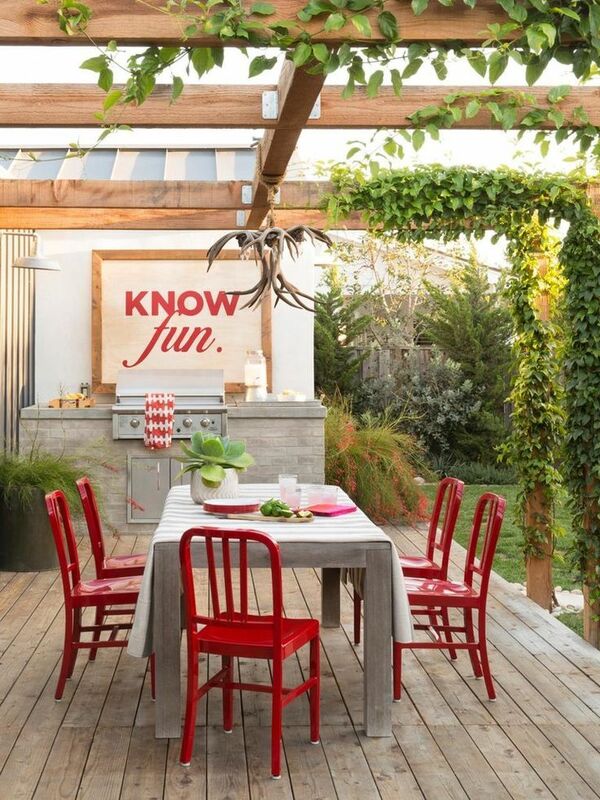 Bare bones design with bold decor choices give this deck-top kitchen a hip, intimate vibe. Welcome to your new favorite brunch spot. Rather than separating the guests from the cook, this pergola kitchen invites conversation during the prep, cooking, and clean up stages. Architectural interest is added to an otherwise standard backyard with this freestanding outdoor kitchen. The height of the pillars draws your eyes upward towards the trees and summer skies. Casual in its construction this bar style outdoor kitchen seems almost serendipitous. Complementary natural stones puts it somewhere between beach and forest. It’s low height construction doesn’t compete with the expansiveness of the wide open sky.